These large crisp rolls, also known as elephant ears, are sure to be a hit as an after school snack. They include children's two favorite flavors - chocolate and cinnamon. In large mixer bowl, combine 1½ cups flour, yeast, dry milk, sugar and salt; mix well. In saucepan, heat water, shortening, and chocolate pieces until very warm (120-130º F; shortening and chocolate do not need to melt). Add to flour mixture. Add egg. Blend at low speed until moistened; beat 3 minutes at medium speed. By hand, gradually stir in enough remaining flour to make a soft dough. Knead on floured surface 3 to 5 minutes. Place dough in lightly oiled bowl and turn to grease top. Cover; let rise until dough tests ripe, about 1 to 1½ hours. 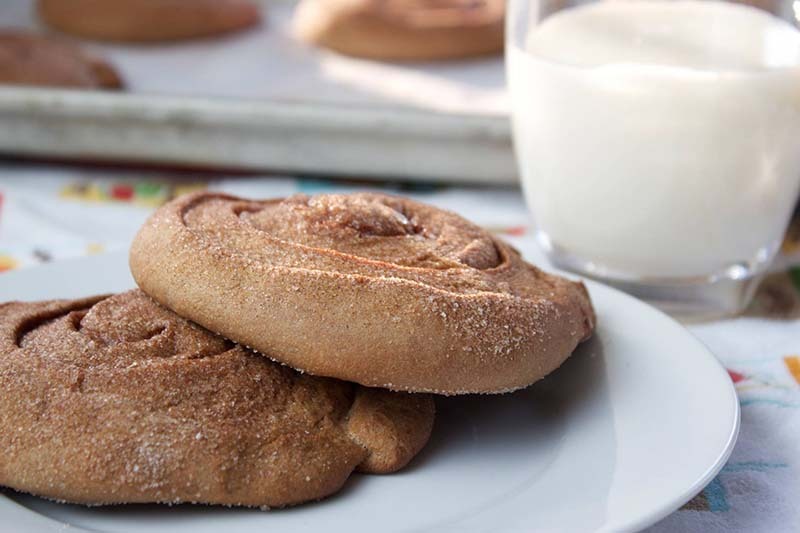 Prepare filling: Combine sugar and cinnamon; set aside. Punch down dough. On lightly floured surface, roll dough to a 12-inch square. Brush dough with melted butter. Sprinkle filling over dough. Roll up tightly. Pinch edge to seal. Cut into 12 slices. Place on greased cookie sheets, 3 to 4 inches apart. Flatten each slice with your hand (spray with cooking spray if needed) to a 4-inch diameter. Cover; let rise in warm place until almost double, about 15-25 minutes. Prepare topping: Combine sugar, finely chopped pecans or walnuts and cinnamon; set aside. After rising, cover rolls with wax paper. With rolling pin, flatten to ⅛-inch thickness. Brush rolls with melted butter. Sprinkle topping over rolls. Cover with wax paper again. With rolling pin, roll topping into rolls. Remove wax paper. Bake at 400º F for 15 to 18 minutes until crisp around edges. Remove from cookie sheets; cool on wire rack. To keep their crispness, store loosely covered or wrap in foil or freezer wrap. I haven’t made these yet but are curious if they really rise to the size shown or if the ones pictured weren’t rolled to a 1/8” thickness? I’m not sure the exact thickness that the ones in the image were rolled to. Let us know if you try the recipe! Can butter be substituted for the shortening in the dough? Yes, you can substitute softened butter for the shortening.